Save 50% on Microsoft Exams at the SharePoint Conference in Vegas! With Microsoft Training and Certification, you can keep your skills relevant, applicable, and competitive. And with Certification Central onsite at SharePoint Conference, you’ll have the chance to learn, practice, and even talk one-on-one with training experts on a variety of technologies. Microsoft Certification is an industry standard recognized worldwide. All Microsoft certification exams will be offered at 50% off the regular price for registered SharePoint Conference attendees. We’re even offering one exam* FREE! Take advantage of this great opportunity to fulfill your certification requirements at a 50% discount during SharePoint Conference 2014. This opportunity is only available to registered SharePoint Conference attendees – at just $75 USD per exam, it’s like getting two exams for the price of one. Note: Discount will be available only at SharePoint Conference 2014, March 3-6th. Note: If the promo code matches the location and the exam you have selected you will be automatically directed back to the Payment Information Page. If the promo code comes up as invalid, please validate you have selected the correct promo code, location and exam number. Please print the confirmation page for your records and note the date and time for your exam. IMPORTANT: The standard registration fee will appear until you enter the appropriate promo code on the payment page. After entering the promotion code your fees will adjust to reflect the discount once applied. If you want to know what SharePoint Exams you can take, Take a look at my Ultimate SharePoint 2013 Certification Guide! Meet me at events near you in 2014! After founding the amazing SherePoint-Community.net online community I had the pleasure to meet a ton of great people online, people to which I talk almost every day on the SPCOM Chat! However, I did not have the pleasure to meet most of the 5000 members in person yet and it’s one of my 2014 resolutions to attend as many SharePoint events as possible, especially in Canada and the US! If you are attending those events, drop a line in the comments and make sure to come say hi during the event! TFS215106: Access Denied. needs Queue builds permissions. 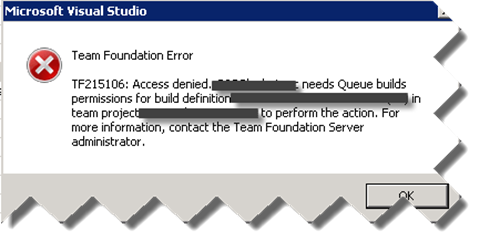 When Trying to Queue a new Build Definition, You might get this error: TFS215106: Access denied. 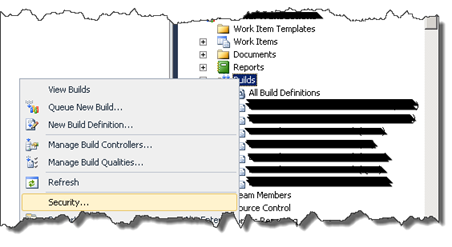 Domain\User needs Delete build definition permissions for the build definition MybuildDefintion in team project MyTeamProject to perform this action. You might get this even if you are a Project Administrator or have all the other rights in TFS because the inheritance for builds might have been broken to provide more security. For example, in my organization, only 2 persons are allowed to launch Build Definitions in UAT and Production. If you ONLY need access on this build right click the build name and click Security. Then add yourself with all the permissions…. However if you’re a TFS Admin and you will have to deploy more builds you can go in the security of the TFS Server by right clicking on your default collection, clicking on Team Project Collection Settings and then Group Membership. And then add your username to the Project Collection Build Administrators Group. Hello everyone and welcome back from the holidays! I recently had a problem where suddenly TFS stopped sending emails and alerts. Furthermore, there was a permission bug with all new projects: The permissions were working perfectly in the SharePoint Site, however no one had the permissions in TFS Web Access. The problem was that the Visual Studio Team Foundation Background Job Agent service was stopped. The Visual Studio Team Foundation Background Job Agent service provides a general scheduling mechanism for Web services and jobs for Team Foundation. This Windows service is also used to run the tasks spawned by various wizards, such as the New Team Project wizard and create a Team Project Collection wizard. 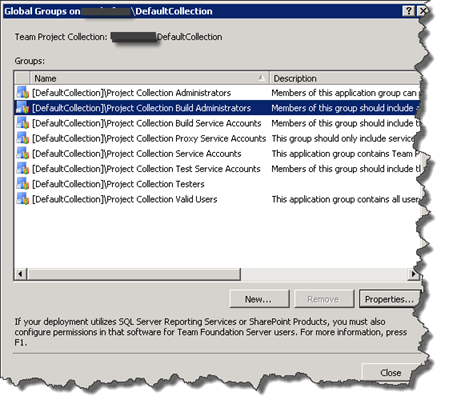 The service uses the service account for Team Foundation Server (TFS), referred to as TFSService. The service runs on any server that is running a Web service or Web application in the logical application tier for Team Foundation. To operate correctly, the service account for the Team Foundation Background Job Agent service must have the permissions required for the tasks that it performs. The service should be on Automatic Startup and should always be running! If you ever experience problems like the ones I had, make sure the service is running!